“In autumn, pumpkins smile. I can smile like a pumpkin!En otoño, las calabazas sonríen. ¡Quiero sonreír como una calabaza!”Celebrate autumn with this bilingual board book! Vibrant photographs paired with text in both English and Spanish follow one little girl as she personifies all of her favorite things about the season: leaves falling, wind blowing, and more. 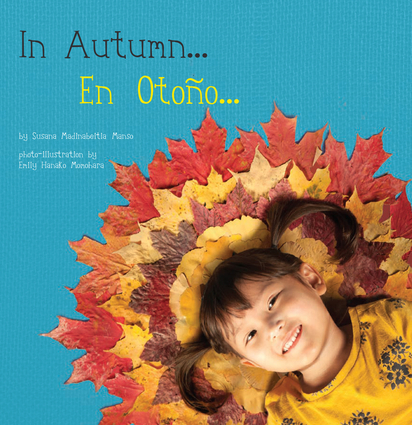 Welcome the autumn season and build language skills with In Autumn/En Otoño! Emily Hanako Momohara is an artist and academic in photography and video arts. Her mixed-race background and belief in education leads her to a variety of commercial and fine art projects about multiculturalism. Susana Madinabeitia Manso is a Spanish teacher and translator. She received her Masters of Arts at West Virginia University and now teaches Spanish at Miami University.